If you don't know, "Reddit.com" is a forum where often celebrities and cool people go and post an "AMA" in which people can "ask me anything." So, redditors go on and post questions and people answer. 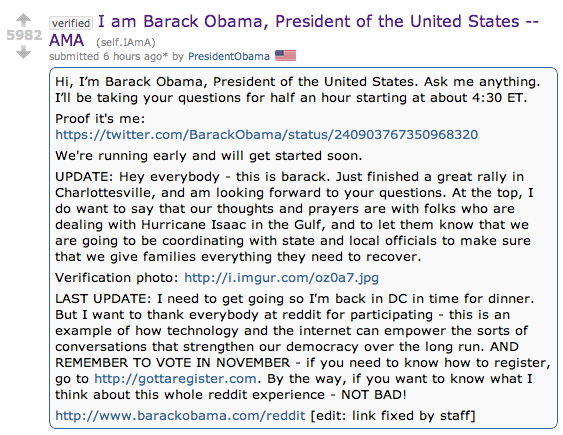 Today, reddit's dream came true when BARACK OBAMA cam on and posted an AMA. He addressed a few questions, quite politcally though, many wished that he had answered with a bit more of a relaxed tone and with more detail, but he's running for president again so whatever. Smart of Obama to get there. 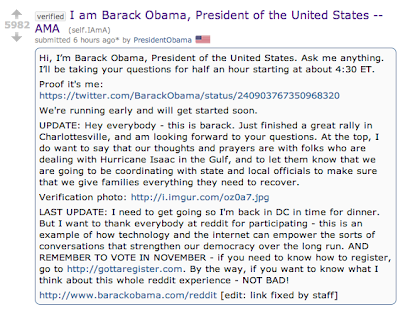 It is funny though that he CRASHED THE SITE and the server went down before he could even start answering questions, but smart of him to keep the idea going that he's the younger, cooler president who knows about and uses social networking and recognizes it's importance. It would be interesting to see if Romney went on, but as they hate him there, it would be risky. Though... I may respect him more if he faced the wolves and didn't hide in his rich neighborhoods and homes.